In this chapter we'll look at reducing sizes of common file types used on the web, with the exception of images. Images are discussed in detail in the next chapter. The easiest and at the same time quite effective performance optimization is to enable compression for all plain text components. It's almost a crime if you don't do it. It doesn't cost any development time, because you're not changing even a single line of code. It's just a simple flip of a switch in your server configuration with surprisingly good results. Let's take a look at how this magic works. Virtually all browsers in use today support compression. Instead of sending the HTML code for a page as-is, you can tell the server to compress it first and send it in the much smaller compressed form over the network. The browser receives the compressed file, decompresses it and renders it on the screen. It may look like extra work, but it's well worth it. The time it takes to compress on the server and decompress on the client is negligible compared to the time saved by having fewer bytes travel across the wire. On average, compression will save you a staggering 70% of the file size across all text-based components. Later in the book as well as in other books and blogs you'll encounter the terms gzip or gzipping as synonyms for compression. That's because gzip (pronounced gee-zyp) is the most popular compression algorithm used in HTTP file transfers. Font files - .ttf, .otf. Some font files in .eot format may be already compressed but that's rare, so enable compression for them too. The only font file exception is .woff; it's a compressed format and there's no need to enable server compression for it. Icon (.ico) files - you can't read these in a text editor but they do compress well. The .ico (just like .bmp) is an uncompressed image format. Files that shouldn't be compressed by the server are those that are already in compressed formats such as JPEG and PNG images, SWF files, PDF documents, Zip file downloads and so on. If you're wondering if a specific file type uses compression, just try to zip it locally on your computer using, for example, WinZip or Control+click > Compress on Mac. If the resulting zip file is smaller by at least 20-30%, you should be using server compression to send files of this type over the network. How to turn on compression? In order to enable compression you don't have to do anything to the files manually. You let your server do it for you. The most popular web server is Apache and that's probably what you're using. Even if you don't have full control over your server configuration, most hosting providers will offer you the ability to tweak configuration via .htaccess files. The file .htaccess is just a specially named file that sits in the directory for which you want to override the Apache configuration. In our case the .htaccess will sit in the root web directory and therefore apply to all the sub-directories, meaning to the whole web site. And you can mix and match the two ways. If your site is running on Apache before version 2 or your unfriendly host doesn't allow any access to configuration, not all is lost. You can make PHP (or another server-side language) do the gzipping for you. It's not ideal, because (architecturally speaking) you'll have your application layer handle the task of the server layer, but the gzip benefits are so pronounced that it's worth the try. With this header the browser informs the server that it (the browser) can handle encoded files that use either deflate or gzip encoding. That's as if the server is saying, "Here's your file and by the way, it's compressed with gzip". If the Content-Encoding is in the response headers coming from your server, that means you set it up properly. If you think you did everything right and it still doesn't work, the first thing to do is check if the browser is indeed sending the Accept-Encoding header. Sometimes, albeit rarely, your browser may be at fault. Keep in mind that very small files will not be compressed. "Small" according to Apache's default settings means fewer than 500 bytes. The reason is that the overhead of the compression is not worth the benefit. Really tiny files may even end up larger after compression. So when debugging your setup make sure you're looking at a file that is big enough. As you can imagine there are certain costs associated with the server compressing the response and the browser uncompressing it. But the costs are negligible compared to the benefits you get. Sometimes under heavy traffic you may see your server stop gzipping for a while although it's properly configured to do so. Apache will stop compressing automatically in order to save processor time under heavy load. There are also some browser quirks. IE6 service pack 1 has problems with decompression although it claims that it can handle it. This was fixed quickly with service pack 2 and you can ignore this edge case. But if you're extra paranoid you can disable gzip for this user agent; Apache allows configuration based on sniffing the User-Agent request header. These ZIP files in disguise are usually not compressed with the maximum compression in order to make the file saving operations faster. For example if you're writing a document in Word, the constant auto-save will not use a good compression level in order to make the auto-saves faster and not interfere with your work. But if you allow such downloads from your website, you can consider recompressing them with maximum compression. For example if you take a Word .docx file and unzip it using a command line tool (or add a .zip extension to it and unzip with a GUI tool) you'll see that it contains a few directories with some XML and other files. Then you can zip again all the files you unzipped but this time using the maximum compression. The results could be anywhere between a 1 and 30% size reduction. It's definitely worth the try, especially since it's just a one-time operation you perform before the document goes live on your site. You could also automate the process, since it can be done by a command-line script. You can also consider a utility that provides even better compression than the popular zip and unzip, such as 7-zip. 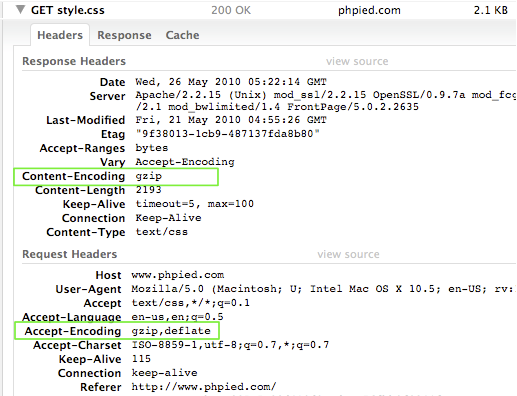 In addition to compression you can also minify certain component types such as scripts and stylesheets. Minification means striping extra code from your programs that is not essential for the program's execution. The code you can safely strip is mainly comments and whitespace. Another part of minification is using the shortest possible syntax when there are several options. And, when safe to do so, minifiers can rename variables by using shorter names. Minification is best done by a tool, because it's nearly impossible to do it properly by hand. Luckily there are quite a few tools available and most are free and open source. All of these tools have web-based UI versions available so you can use the tools without installing them. How much size reduction can you expect from minification? Running the popular jQuery library through all the tools mentioned above shows that savings are between 40% and 60% depending on the tool. So the recommendation is: do it. The concrete tool you use doesn't matter all that much, pick anything you're comfortable with and it will still give you the significant approximate 85% savings of gzipping and minification combined. The minifier can use shorter syntax when applicable, for example stripping units of measure (e.g. px) when the value is 0 or using shorthands. Another task for the minifier is to use the shortest color syntax. An important note here is that in CSS we deal with a lot of hacks. Since the browsers have parsing issues (which is what hacks often exploit), that makes the minifier's task even more complicated. Not only does it have to properly handle the CSS syntax (better than some browsers) but it must also understand and preserve the hacks that resolve browser bugs. Both YUICompressor and CSSTidy tolerate a lot of hacks, but probably not all, especially some of the more exotic ones, so approach CSS minification with care. Before trusting the minifier test it to make sure it supports the hacks you're likely to use. Due to the challenges of minifying HTML, it's usually not safe to let a tool do it for you automatically. Additionally, most of the pages on the web are not static but are dynamically generated by a server-side scripts. One simple way to do HTML minification is to just make sure you're not creating white space when producing HTML in your server scripts. That, of course, makes HTML harder to read, but with modern DOM inspectors such as Firebug, "View Source" is rarely used, so unreadable HTML will not often be an issue. Not creating whitespace and comments is the easiest HTML minification and often has the biggest benefit. But if you are really determined to produce the lightest HTML possible, there are more options. Before we dive into low-level HTML minification, a word of warning: these are micro-optimizations, they are high risk and low benefit. Try one of your pages in a minification tool to see the potential benefits from optimizing one page. Only if you see you have a lot to gain should you heavily invest in minifying whole sites. Let's see some options for producing minimal HTML code. Boolean values that are required in XHTML can be skipped in HTML, e.g. As you can see, most of these HTML minification techniques would require you to edit static pages, server-side code or code in templates and are not easy to do safely. Combined with the relatively small benefits, these techniques should be used carefully, if at all. Minifying RSS feeds and other XML documents is much safer than minifying HTML, as it's OK to strip all unneeded white space in XML. Since these documents are usually generated by a script and not written by hand, you don't need to use a minifier tool. You can simply make sure that there are no white spaces produced by your XML-generating scripts. If minification only adds a minor benefit compared to the benefits of serving compressed content, you may wonder if it's worthwhile. While even small savings do add up, a stronger reason is that as many as 15% of all users will never receive compressed content. A number of firewalls and anti-virus software choose not to deal with compression when monitoring your network traffic. That's why they hack the outgoing requests from the browser and modify the Accept-Encoding to make it invalid, e.g. Without a valid indication that the browser supports compression, the server sends the response in plain test. That's why a significant number of users never get a compressed response, although their browsers are often perfectly capable of supporting it. In conclusion: minification helps. Not only because compressing minified responses makes even smaller files, but also because in 15% of all page views there is no compression support, despite your best efforts. If you want to help these users that really do support compression but aren't telling you so, you can get a bit fancy and send them compressed content anyway. If you are careful and you check to make sure that the user's browser really can handle compression as described in Andy Martone's talk, you can safely give gzipped content back to a number of these people. When talking about reducing the size of components, the smallest component you can ever have is the one that has no body, only headers. This is known as a 204 No Content response and is mainly useful for logging, tracking, or any other type of request where you need to send something to the server, but don't really need a response. Often people use 1x1 GIFs for logging and tracking, but that means still sending around a hundred bytes for no reason. For an example in the wild, see Figure 4.3, which shows how Google search uses 204 responses for logging purposes. Note also the Content-Length header, which contains the size of the component's body in bytes. In the case of 204 responses it has the value of 0. Figure 4.3. 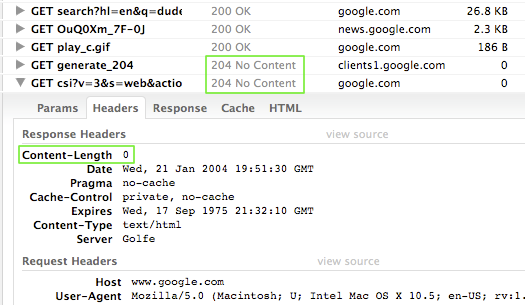 Two requests on Google search returning 204 No Content responses. Recompression - some downloadable files such as Word DOCX are actually ZIP files with a different extension. They are usually not compressed at the best compression levels, so you can save up to 30% by recompressing them with the highest compression.